Abuja — Exactly 19 days after President Muhammadu Buhari was declared winner of the February 23 presidential election by the Independent National Electoral Commission (INEC), the candidate of the Peoples Democratic Party (PDP), Alhaji Atiku Abubakar, has filed a petition challenging the victory of the All Progressives Congress (APC) candidate, President Muhammadu Buhari, at the poll. Atiku and the PDP in the petition filed yesterday asked to be declared the winner of the election. In the alternative, he asked the Presidential Election Petition Tribunal to nullify the election and order a fresh one that would be counted in line with the country's electoral laws. A member of the legal team, Chief Mike Ozekhome (SAN), while confirming the filing of the petition said: "The petition was solid, strong and unassailable," adding: "The true owner and keeper of the people's mandate would soon be declared." Speaking on calls on Atiku to drop the legal action in the interest of peace in Nigeria, Tsauri said: "If you are cheated in Nigeria and in the world over, the last resort for the common man is the court. We believe, we are very confident and we are very optimistic that we won the election. "So, simply because people are saying let Nigeria be in peace, it does not mean we should not seek redress and reclaim our mandate. We still stand on our point that we won the election and we are going to claim our mandate. "We want the tribunal to look at the merit of our litigation approach. Like you know, the court has given us the go ahead to inspect the election materials, which INEC has not given us the go ahead up till now. We want the court to insist on us inspecting the election materials. Then after that we will open the arguments. We have our team of lawyers, who are very conversant with the procedure, very qualified, very fearless and very wise." Talking about the chances of his party to get free and fair judgment from the court, he said: "We know that we are dealing with a government that is ruthless and government that does not respect law. We know. But then, that does not mean we should not seek redress from the court because if we don't do that it means the courts are not useful. So, we are coming to the court. They should declare us and I believe the court is going to do the right thing because we are very confident; if you start with the Court of Appeal, these are judges that you cannot compromise anytime of the day. Their integrity is guaranteed and we believe in them. They will do the right thing and the right thing is to get our mandate." 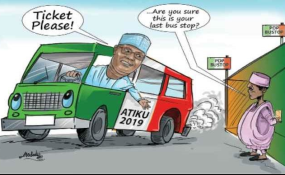 Reacting to suspicion in some quarters that owing to the sudden defection of the Director-General of the PDP presidential candidate's campaign organisation, Mr. Gbenga Daniel, to the APC, Atiku might have been back-stabbed by members of his party, Tsauri said: "No! No! No! Forget about that! Even when he was in the campaign organisation we believe and we are confident that he has been a mole in the system. We expected his leaving the party. We don't have any ill-feeling. He will not add value or subtract value from anything we are doing." Meanwhile, the PDP and the Coalition of United Political Party (CUPP) have described Buhari's posturing on free and fair supplementary elections as a fresh subterfuge to divert public attention from the APC's rigging plots. But the PDP and the CUPP yesterday described the president's assurance as a direct confession that the presidency used its overbearing influence to rig the February 23 presidential election. The PDP in a statement yesterday by Ologbondiyan said Buhari could not exonerate himself of the harm inflicted on the country's polity by the deployment of soldiers in the general election, as nobody deploys the military except the President and Commander-in-Chief. It stated: "The presidency's confession that APC members are mounting pressure on Buhari to help them to rig the supplementary elections further confirms the Buhari presidency's manipulative and rigging capacity, including militarisation of the electoral process, instigating of violence and alteration of results, as were freely used by the APC in the presidential election." "Now that President Buhari, in his official capacity, has come out to state that he will not intervene in the March 23 Supplementary election; we ask, is Mr. President assuring Nigerians that any 'soldier' seen directly involving in the rerun election is fake and should be treated as such?" According to him, "He likes to market a personality of honesty but behind the curtain he weighs zero on the integrity scale. What kind of comment coming from a man who refused to sign the electoral act that would have helped make our electoral process better. He deliberately refused to sign the law and pushed our people into witnessing the worst bloody electoral battle." He stated: "A commander-in-chief who watched his soldiers overthrown INEC collation of result centre in Rivers and used their own hands to attempt to smuggle in fake result. Is only a kid can take the president serious. "We have told the people of the supplementary election states to get ready to defend their votes and never put their trust in a president who in the first place provided the environment for the electoral violence already visited on them."